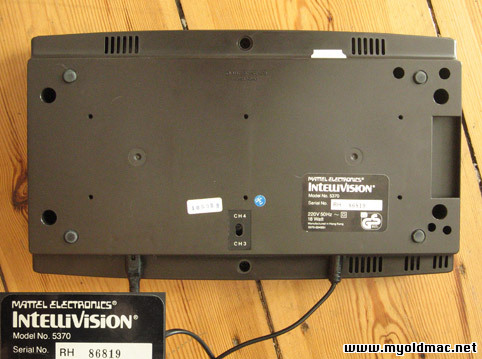 Intellivision console with original power supply and TV cable. The power supply (240v) is build inside the case. The Console is tested and works, controlls ware reliable. Please see the photos. The first 16 bit videogame system of the history is today a collector item everywhere in the world. 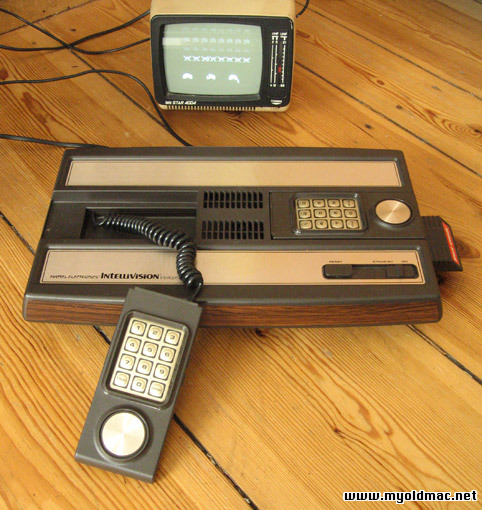 Intellivision, the first 16-bit videogame system, was introduced in 1980 by Mattel Electronics. With realistic graphics and challenging games, Intellivision quickly earned millions of loyal fans. 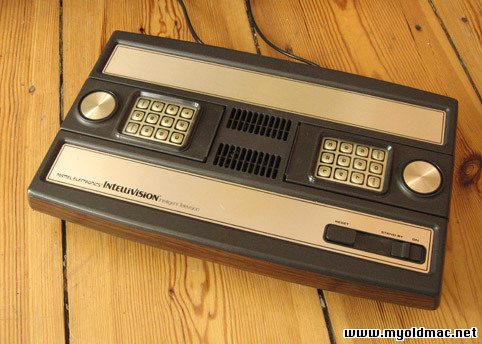 Thanks to the support of those fans, Intellivision was the only videogame system to survive the 1983 industry crash. Consoles and new games were made until 1990, well into the Nintendo era. 16-bit 1 Mhz 1610 microprocessor; 4K internal ROM operating system; 2K RAM; two hand controllers with 12 button keypad, 4 action keys, 16-direction disc; 159 by 96 pixel background resolution; 16 colors; 8 moving objects; three-channel music generator; plays external ROM game cartridges. The Intellivision was test marketed in 1979 in Fresno, California, along with four cartridges: Poker & Blackjack, Math Fun, Armor Battle, and Backgammon. The test was a success, and in 1980 the Intellivision went into wide release. 175,000 were sold in 1980, 500,000 in 1981 and another 500,000 in 1982. Counting the Intellivision II and the Sears, Radio Shack and INTV clones, approximately 3 million master components were ultimately sold. FUN FACT: Magnavox actually patented the concept of the home videogame when they created the Odyssey Game System. When Atari released the 2600, they obtained a license from Magnavox, reportedly at a very low price. 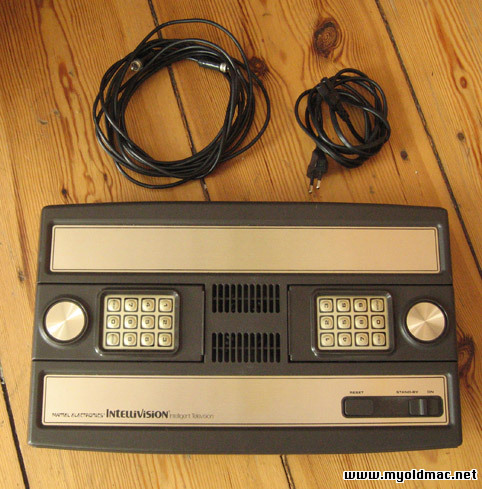 By the time the Intellivision was released, Magnavox realized their mistake. They demanded a hefty fee from Mattel for each Master Component sold. Sie bieten auf eine Intellivision Konsole von Mattel von 1980. Die Konsole ist getestet und kommt mit Strom und Antennenkabel. Das Netzteil (240 v) ist eingebaut. Die Konsole ist in gutem Zustand, bitte sehen sie die Photos. Das Intellivision wurde von der Unterabteilung Mattel Electronics entwickelt, die zur Entwicklung elektronischer Spiele gegründet worden war. 1979 wurden das Gerät und vier dazugehörige Spiele in Fresno auf den Markt gebracht, um seine Markttauglichkeit zu prüfen. 1980 wurde das System schließlich zum Preis von $299 mit dem Spiel Las Vegas Blackjack in den ganzen USA veröffentlicht. Obwohl Mattel nicht als Erster mit Atari konkurrierte (Fairchild Semiconductor, Bally und Magnavox hatten bereits Spielkonsolen auf den Markt gebracht), war das Intellivision die erste ernsthafte Bedrohung für Ataris Vorherrschaft auf dem Videospielemarkt. In einer Reihe von Werbespots mit George Plimpton stellte Mattel gnadenlos die technische Unterlegenheit des Atari 2600 gegenüber dem Intellivision dar.